When we first met the people from Nexus 21 at CEDIA we were blown away by their whisper quiet concealment systems. Their ceiling flip down was the perfect piece to compliment a smart home with a beautiful view of the Hudson River and New York City skyline. After seeing the project on our website, Nexus 21 contacted us to feature it on their website. Just a few years ago Serious AV was hired to turn a luxury, New Jersey apartment into a smart home. When President, Casey Johnston, walked into the master bedroom he was met with a wall of windows looking out on the New York City skyline. “The whole point of that apartment, is to have that gorgeous view,” Johnston said. 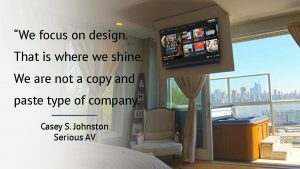 With one decision, Johnston was able to turn that project into recurring revenue for the company and just completed his second install in the home — and first install of a Nexus 21 flip down TV lift.